Ogunquit- 3 BR Getaway - Great reviews! Property Size 1,638 sq. ft.
*NOTE: The "Total Price" in the Instant Quote box includes your REFUNDABLE security deposit of $300, the Maine 9% State Lodging Tax, and any other applicable fees. Come enjoy a week in Ogunquit with the family at this beautiful 3 bedroom 2.5 bath home! Only 1.3 miles from the beach and even closer to Ogunquit Village. 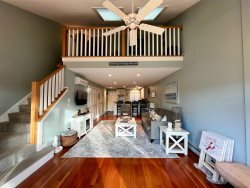 Enjoy the quiet of this exclusive neighborhood set back from the rush of Ogunquit while only being a walk or short car ride into town! Sit on the back deck with a glass of wine and relax or sit by the firepit at night after a long day at the beach and unwind. The main floor boasts a large living and dining room area as well as the main floor half bathroom while the 3 bedrooms and full bathroom are upstairs. The property at 40 Meadow lane was excellent. The hosts of the property have thought of everything. What a great. Experience our family had! !